Included are 3 x 350g pouches of Truly Irish Oat Granola. Low in sugar only 6.5g of sugar per 100g. 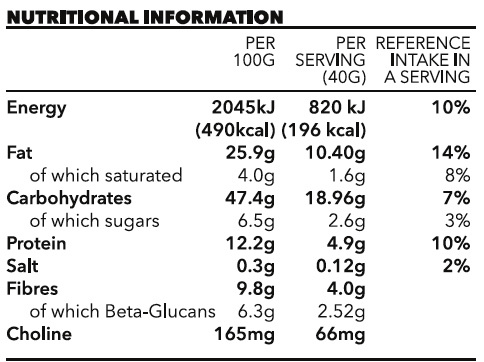 High In Fibre – 9.8g of fibre per 100g. Lowers Cholesterol – Truly Irish Oat Granola contains oat beta glucan, a soluble dietary fibre. Beta glucan from oats has been shown to lower blood cholesterol. Consuming 3g of oat beta glucan per day may lower cholesterol as part of a healthy and balanced diet and active lifestyle. Suitable for Vegetarians: This product does not contain any product of animal origin. 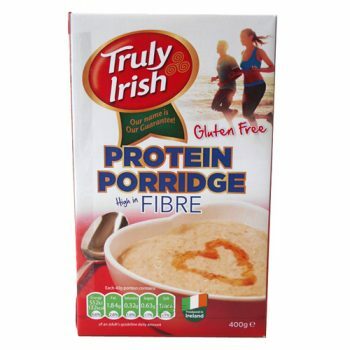 Irish Oat Flakes (55%) (gluten), Vegetable Oil; sunflower, Muscavado Sugar, Sunflower Seeds, Oat Bran (gluten), Sesame Seeds, Coconut, Sweetener; Crystalline fructose, Almonds Flakes. Walnuts, Choline bitartrate, Salt, Vanilla. For allergens see ingredients in bold. Prepared in a factory which handles other cereals containing gluten, and also handles peanuts, nuts and seed ingredients. If you have reason to complain about this product, please return the packet and its contents to the Customer Service Manager at Truly Irish stating where it was purchased. Alternatively email your query to: info@trulyirish.com This guarantee does not affect your statutory rights. Produced in Ireland for Truly Irish Country Foods, Newcastle West, Co. Limeick. Ireland.